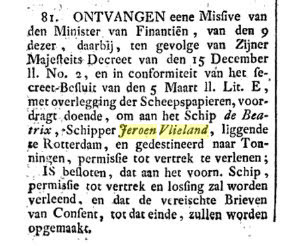 of the 15th of December last number 2 and conform the decree decision of the 5th of March last.Lit E.With presentation of the ships papers to the ship Beatrix, skipper Jeroen Vlieland located in Rotterdam destined to Tonningen given permission to leave. And will , beside the reported papers and the submitted ship's papers. extract sent to the Minister of finance ,to give this decree the necessary execution.